Bones (Iain De Caestecker) lives with his younger brother, and mom, Billy (Christina Hendricks). The family is struggling to pay their mortgage in a decaying Detroit suburb. Bones has taken to stripping houses of their copper, while Billy takes a up a job performing at a Grand Guignol theater at the behest of her creepy banker. Bones and his friend Rat (Saoirse Ronan) cross paths with Bully (Matt Smith), a deranged thug who claims some copper ripe territory. Dark forces threaten to destroy the family if they don’t find a way to escape Lost River. There is a powerful melancholia that pervades Lost River. Amongst the decay of Detroit, there is the weight of a sadness so heavy it feels almost lyrical. Characters violently struggle to survive in the crumbling environment, but that decay seems to touch them all. It’s in these small moments that the film begins to show it’s own unique character. I am a big fan of creaky first novels and first films, they are often bursting with half articulated ideas that have usually been gestating inside someone’s mind of years. 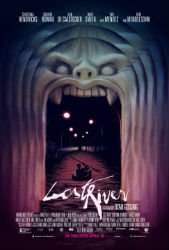 It can be a thrilling and frustrating experience to engage that work, Lost River is no exception. "Hey, if you didn't want to dance, you could have just said, no"
Lost River blatantly displays its influences on the screen. It carries a slow ponderous story that is punctuated with moments of violence and a neon color palette much like the Nicolas Winding Refn films director, Ryan Gosling acted in. It also draws comparisons to David Lynch with instances of dream logic and an obsession with fire. If you can accept these moments of seeing a filmmaker thrilled at being able to create something like those he’s admired, you can begin to see someone also finding their voice as a director. It feels so heavily buried by what it emulates, it can be difficult to discern. Christina Hendricks is good as Billy, the put upon mother of Bones. She is thrust into increasingly outre situations and manages to keep her character grounded and her reactions naturalistic. Iain De Caestecker is quite believable as Bones, bringing to life a character that is simultaneously reckless and terrified. I don’t know that Matt Smith would be anyone’s first choice for a heavy, he’s a lanky mess, but he uses that to his advantage. His physicality is at such odds with his role as the villain, it creates a character that feels unpredictable if never truly terrifying. The music is an eclectic mix of electronic, orchestral, and even a brief musical number or two. It’s a heady mishmash that does wonders to try and help glue the often patchwork story together. Lost River has some very strong visual and emotional content, but it’s actual narrative feels threadbare. As a first film, it shows a lot of promise, and I hope Gosling has more opportunity to direct. I am very interested in seeing his auteur voice develop. It’s a film that seems entirely composed of homages and quirks, but there is enough striking imagery to warrant sitting through a muddled story.